Or as low as $17.69 per month over 12 months. Apply Now. 19” rack mount option for one or two receivers. Multi-channel wireless simply does not get any easier. Based on Trantec’s award winning S4000 Series, The TOA S4.16-RX is 16 channels of tough, reliable quality that is priced to suit the tightest of budgets. This multi-function system is optimised for use with handheld, lapel mic and a range of headsets – or switch to use with a musical instrument. A single 9V battery gives approximately 10 hours of quality performance with a range of up to 100 meters. 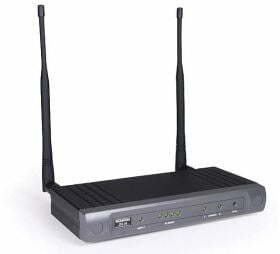 The S4.16 Dual Channel Wireless Receiver is a multifunctional system available in 16 selectable frequencies which can run up to 8 simultaneous channels. The S4.16 couples efficiency and simplicity to ensure consistent performance each and every time. The S4.16 Dual Channel permits multiple receivers to conjoin, perfect for schools, churches and audio visual applications.